Hello! I know it’s been awhile since I’ve posted….no internet…more on that as we move along. (I’m posting this from a side trip I took today where there’s a good signal – the side trip will be another post.) This will be long post as there isn’t much of a way to cut it in half....and no proofreading time! After two months still roaming around Arizona after leaving my winter spot in Yuma, I’m finally in another state. New Mexico! The Land of Enchantment. I left McHood Park in Winslow Monday, May 25th, heading to Gallup, NM….only a 2 hour drive. I decided to stop in Gallup (right on I-40) instead of going the back roads to the new site for a couple of reasons. There were a few things I needed and Home Depot, WalMart and a Cracker Barrel are all next door to each other….very convenient for shopping and for a parking lot sleep over. The only thing I couldn’t find was Wi-Fi. It was down at McDonalds and my free wi-fi app didn’t pick up any other possibilities except in hotels, also nearby, but I couldn’t reach them from the parking lots. Internet is my biggest (and most expensive) stress in life! 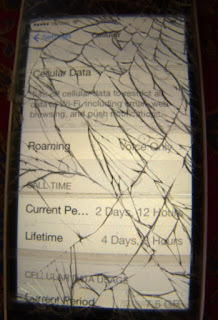 AND I dropped my cell phone and this is what I’m dealing with for another year until I’m eligible for a new phone (unless I want to pay $600 for a new one – that’s not going to happen!) Needless to say, it’s very difficult to see anything on it. It’s all a racket, if you ask me! Mostly, it is flat land with sign after sign advertising Native American wares. The area is surrounded by reservations and the bulk of the population is Native American here. So, we get into Gallup, do those errands and end up spending the night behind Cracker Barrel. 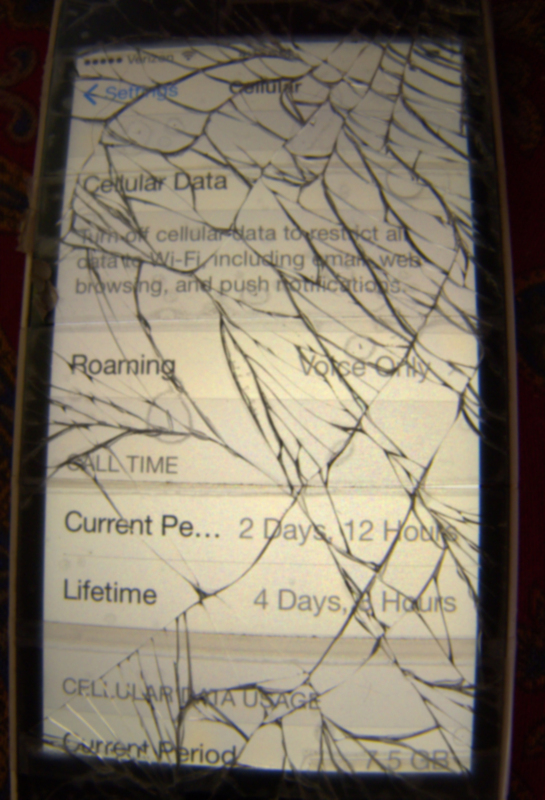 Not optimal, but it’s what you have to do sometimes in this crazy RV life. It serves the purpose. Woke up early to the sound of food delivery trucks and decided to just get going to the new site after getting gas. No point in sitting around the ol’ Cracker Barrel parking lot. The new site was just an hour or so away and it was a pretty morning. We’re at the higher elevations again (6000’), so low 70’s prevail during the day. Perfect! We’re on two different highways out of Gallup to get to the site. Rt. 602 goes south and dead ends into Rt. 53 after about 35 miles. We take a left (east) on 53 for another 25 miles. A lot of this area is the Zuni Reservation. There isn’t much to see until a few mesas pop up. I had 5 bars of Verizon service part of the way but as we got closer to the site, it diminishes drastically....to intermittent one bar. Now for the unveiling….where we ended up! Not too shabby! Like many campgrounds, it’s a loop with sites on each side. The name of the loop is intriguing! And....it is very appropriate! I've seen a lot of "big sky" starry nights, but NOTHING has compared to this. Millions and millions of stars....probably every constellation could be spotted if I knew more about astrology. We went around the loop once to preview the sites. Hmmmmmmm….just about every one is taken or won’t accommodate my size rig. I had been holding my breath for days that it wouldn’t be full. Several tenters were taking up the spaces, along with some small campers. There’s a 27’ limit….I’m about 29.5’ with the cargo rack on the back. With no other viable choices, I finally had to pull into the last site - #9. WAY not level! Cab nose pointing down quite a bit. Not so good. But, we’ll try it for awhile. We hopped out and surveyed our site in more detail. It was actually really nice if it wasn’t for the bad slant. It was really suited for tenting….that area, behind the trees, was totally flat. Decided to get some fresh air right off and take a walk back out toward the entrance before setting up camp…Nikko needed a walk and I needed to see if I could pick up a cell signal. His walk was by far the more successful of the two objectives. We could see the El Morro rock formation in the distance when we walked to the end of the loop…pretty cool! And, we could see it through the pine trees, too. On the way back, the camper that was parked in site #8, somewhat across from us but not directly, was heading out. I stopped them and YAY! they were departing for good! Their site was a nice one AND level! 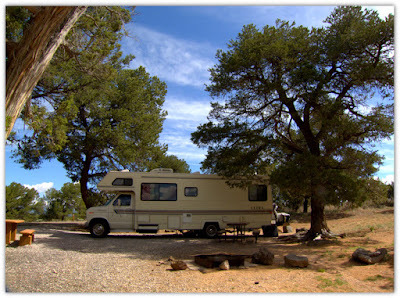 We quickly made our way back to the RV and relocated! Good thing I hadn’t set up camp yet! We backed in and it’s perfect! And HUGE! Two picnic tables, a really large ground grill and no one on either side. In fact, there’s a big field on one side. There’s a potable water spigot right across the lane and rest rooms behind us just up a little hill, and bear proof trash receptacles. Yes, there are black bears around here! And deer and elk and several other indigenous animals. Now some info about El Morro. If you are not into history, just look at the pictures! And what I’m writing is a very, very brief historical overview of the area. On a main east-west trail, dating from antiquity, rises this great sandstone promontory with a pool of water at its base. 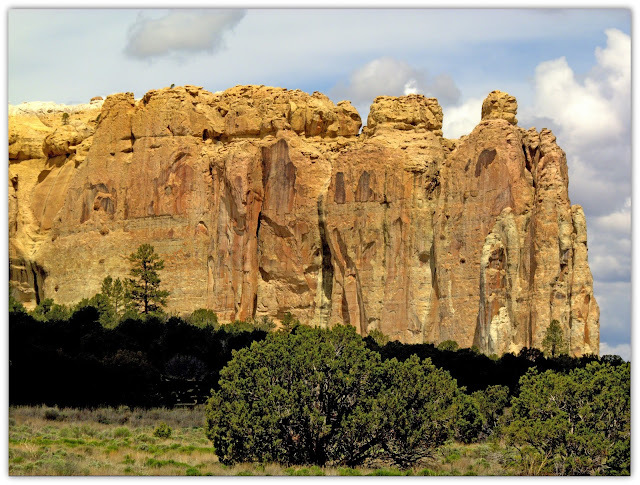 The Zuni Indians, whose Puebloan ancestors lived here, call it Atsinna – “place of writings on the rock”. The Spaniards called it El Morro – “The Headland”. 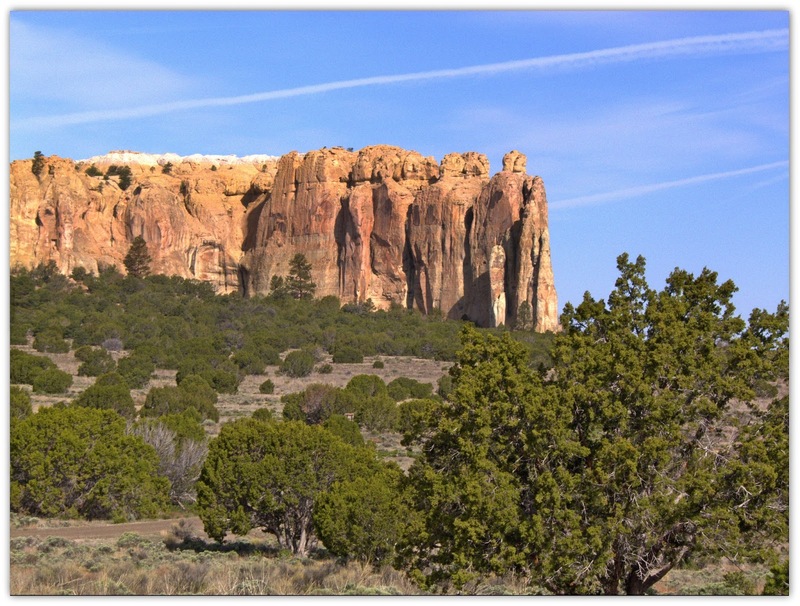 Anglo-Americans called it “Inscription Rock”. 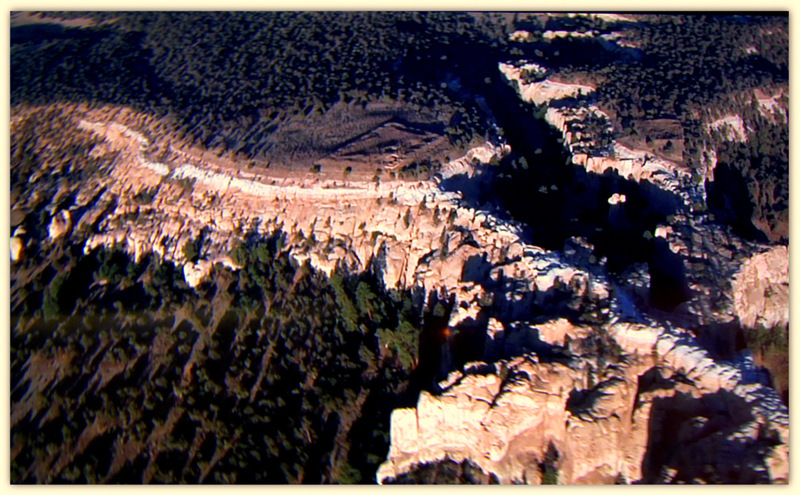 Over the centuries those who traveled this trail stopped to camp at the shaded oasis beneath these cliffs. They left the carved evidence of their passage – symbols, names, dates, and fragments of their stories that register the cultures and history intermingled on the rock. 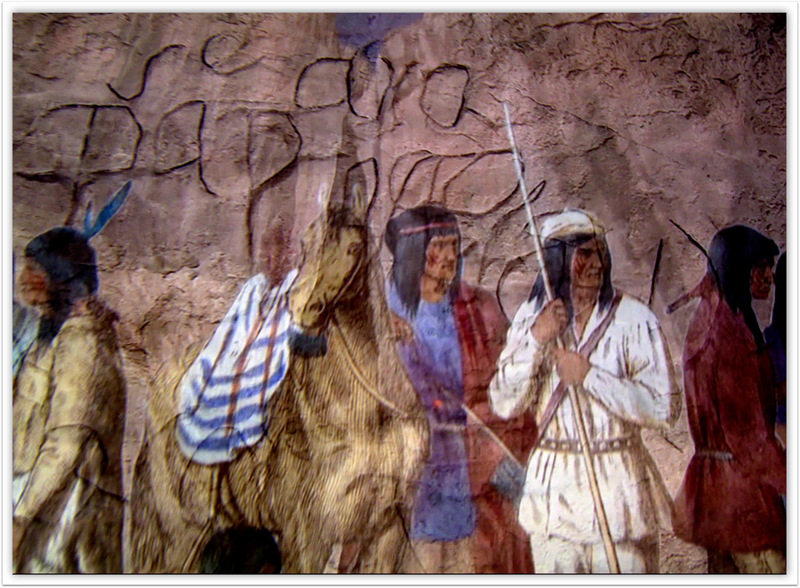 So, first we have The Puebloans, the ancient villagers, who first inhabited El Morro. 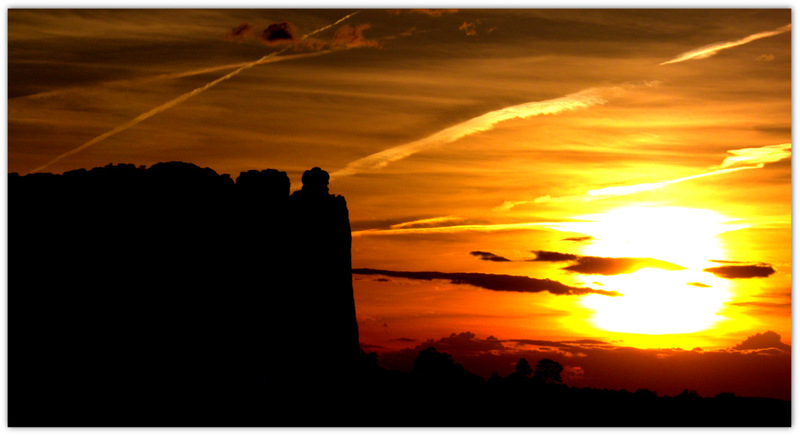 The Atsinna Ruins are atop El Morro and date to the late 1200’s….but they were abandoned after only about 75 years. Atsinna and other nearby sites continue to be sacred places for the Zunis. Next, The Spaniards enter the area. Explorers Francisco Vasquez de Coronado, Antonio de Espejo and Don Juan de Onate are known to have passed through El Morro. On March 11, 1583, Espejo recorded his stop at a place he called El Estanque de Penol or “the pool at the great rock”. 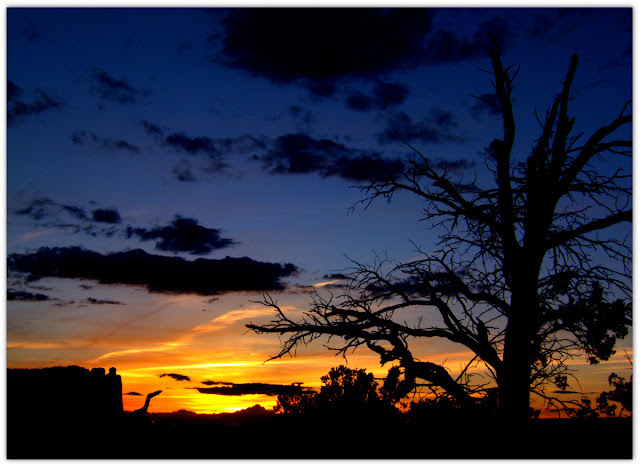 In 1598, Onate officially colonized New Mexico. However, his efforts proved fruitless after bringing 400 colonists, 10 Franciscans and 7000 head of stock north out of Mexico due to hard winters, lack of food and the great distance from their homeland. 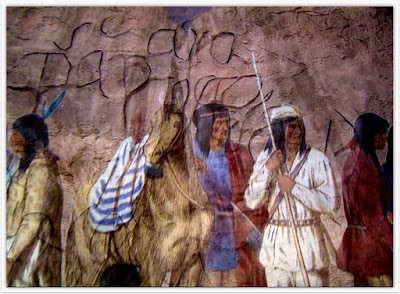 However, during one of his expeditions looking for better settlements, Onate inscribed his name at El Morro on April 16, 1605 – the first known European inscription on the rock. 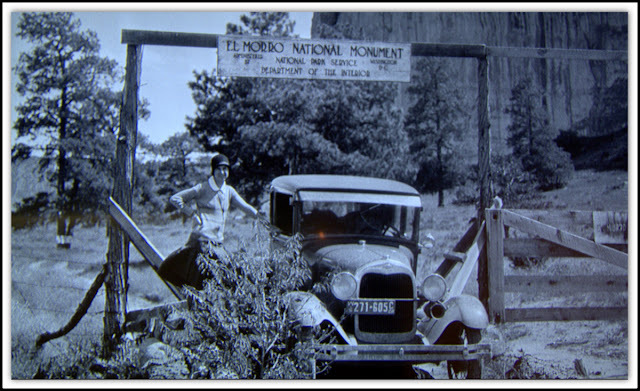 Over scores of years, there followed many, many more Spanish inscriptions by governors, soldiers, and priests as they took the El Morro route to Zuni and other western pueblos. 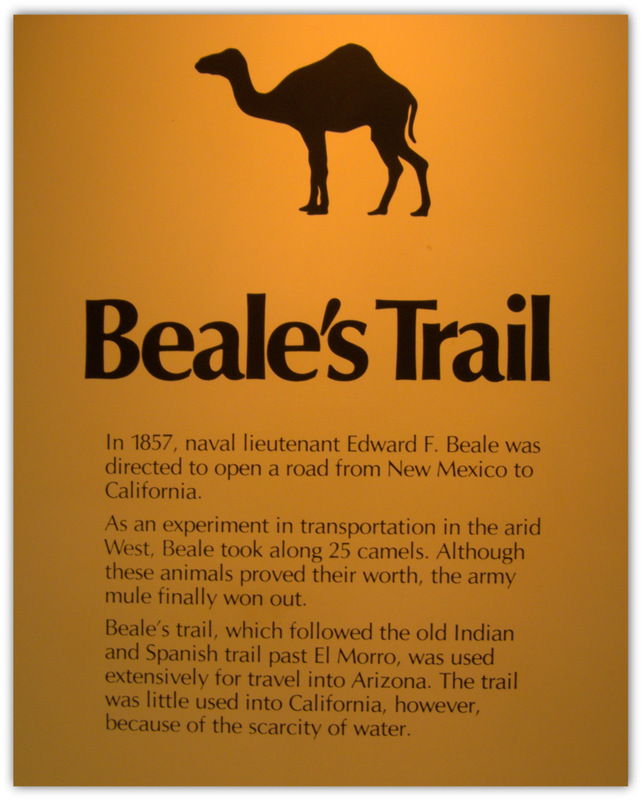 Finally, The Americans, as they were expanding westward, also used this main trail….primarily emigrants to California. One group, escorted by a company of dragoons, passed through in 1849. Another party that same year robbed the hospitable people of Zuni, who traditionally welcomed and fed all travelers. A later party left 26 names on the rock. Army exploration and railroad survey expeditions stopped at El Morro in 1851 and 1853. In 1857 the Army experimented with camels for desert transportation….a caravan more Arabic than American. Ultimately, however, mule trains won out. Eventually railroads took over and the El Morro trail became a thing of the past. El Morro was proclaimed a National Monument by FDR in 1937 (I think…using memory here). The gigantic rock formation is sandstone…which was very conducive to carving the inscriptions of those who traveled the route for centuries. But, sandstone is also very susceptible to erosion from weather, blowing sand, etc. Many different types of preservation techniques have been used over the years to try to preserve the inscriptions, but nothing was really feasible. Therefore, the inscriptions will one day be gone forever. Even at this point in time, they were difficult to photograph. Those left by the Spaniards seemed to be the most visible....and the fanciest! With close inspection, however, there are to be about 2000 name carvings. I might go back another day to look a lot more closely. 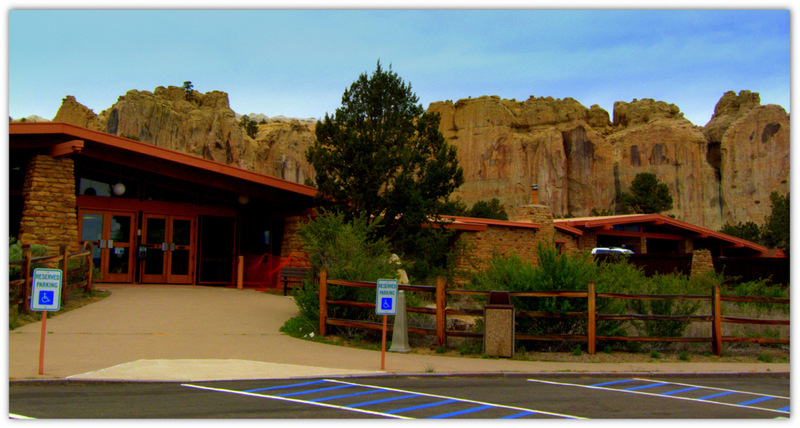 There is a wonderful Visitors’ Center at El Morro. There are two self-guided trails (1/2 mile and 2 miles) that take visitors in and around El Morro. 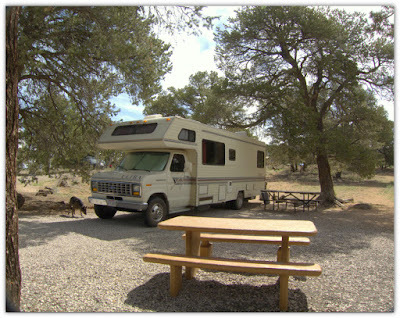 There are NO fees at all for visiting El Morro or to stay at the campground for 7 days. I opted for the 2 mile trek. This is definitely NOT for non-hikers or anyone who is afraid of heights or cannot endure a strenuous walk. We’re headed to the TOP of El Morro! I had the entire trail to myself. Let’s start the hike! Most of these photos are self-explanatory. The trail leads around the “front” of El Morro to the top. Switchback after switchback....onward and upward! Whew! It's quite a climb! Once at the top, the trail makes a large elongated oval around a canyon in the center. Here is an aerial view (I took this picture from the video I watched before starting the hike -- hope you can see it.) Start at the upper right and come around to the front of the photo...destination is the rectangular area. The darkest part is the center canyon. It’s a trail, but not what I was thinking it would be. For the most part, you just follow the etched lines in the stone and the cairns (stacked rocks). That’s it! No rails and not much room for error. It got slightly windy at the top and that was a little disconcerting. Luckily, it didn’t last! Here and there some steps have been carved out, but for the most part, it is totally natural. I doubt I will ever be anywhere else like this! The “trail” loops 3/4 of the way around the canyon and then back to that flat, rectangular area you saw from the aerial view. I can finally see where the Atsinna ruins area is….thought I'd never make it! A few more steps and I’m up on the plateau of the ruins! Wow! At one time there were up to 350 “rooms” here. But, we should be grateful that we can see what remains. So well preserved…thank you FDR! I spent quite a bit of time up there just perusing the ruins, looking at the expansive views and trying unsuccessfully to truly envision those who inhabited this area. Finally, time to go. The trip down ended the 2 mile loop and it was only about ½ mile from the ruins back down to the Visitors Center….then another .60 mile walk back to the campground. I was pretty much exhausted by the time I got back! So, this is where Nikko and I have been hanging out. I HIGHLY recommend visiting El Morro National Monument if you are ever in this area. There is so much more to know about the history of El Morro than I could ever describe here….plus, my photos do not do it justice. I’ll be here until the first part of next week. Then back up to Grants, NM to head to the next stop. Hopefully I can find a place to connect to the outside world and fill you in on today’s interesting side trip IF I have any data time left. This post probably consumed 4Gs and I only had 7Gs left when I started. Hope you enjoyed this trip to El Morro! Til then, Happy Trails and thank you for placing your Amazon orders through my blog! As always, a great story and great photography, Tiff. We will definitely be adding this place to our future travels! We're down to less than 60 days now before we are due to leave, but there's a lot to do yet! I hope we can get out of here on time! Stay well and travel safe. Thanks again for such a great group of pictures and commentary! 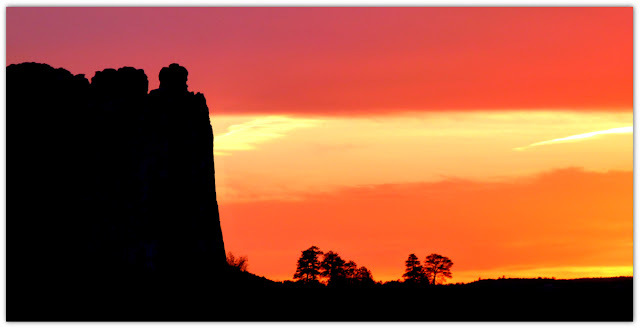 There is so much history all over the country that no many of us get to see! Thanks for sharing your travels! A great stop! I live ruins and the inscriptions. Thinking who was there.....what they endured....how they lived. So glad former presidents preserved so much of this country for all to enjoy! Thanks for all the photos and descriptions! Best post so far (and they all have been very entertaining. I was just thinking today I hadn't seen one from you in a while. My cousin teaches on the reservation about an hour from here so it meant a lot to me. A beautiful description of an extraordinary place. Maybe you can chronicle the ruins of Chaco Canyon next.